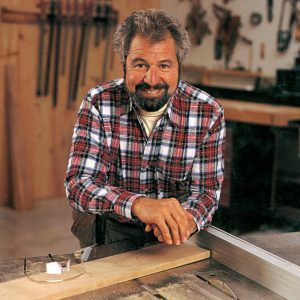 Remember Bob Vila? With his folksy charm and his multicolor beard, Bob was at the forefront of todays HG Television and the home improvement craze that hasn’t let up since “This Old House” debuted in 1979. Bob is the kind of guy you wish was your neighbor. Capable of any alteration or salvage. He even made it look easy and fun. If you’ve attempted anything Bob has done on television yourself, you may be like me and understand that D.I.Y. doesn’t mean “Do It Yourself”. D.I.Y really means “Do it YELLING“. I can pinpoint scars from lots of home improvement attempts. I’m just lucky I still have all my fingers! 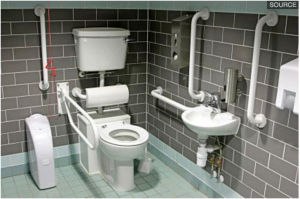 Thanks to Bob Vila and other TV personalities just like him, families today have much less fear about knocking down walls or making modifications in bathrooms to enable easy access for physical limitations. And the safe bathing upgrades are both attractive and functional (finally). With a bath space upgraded for safety, and 24/7 care from Always There Home Care available, families in Columbus have the option to stay in their home no matter their condition or their *limitations. The trends today are leaning not just towards the new, but revitalizing the relics. Homeowners today are reclaiming these ornate materials that (like all of us) have aged like a fine wine. You can build a home (and pay a premium) using lumber sourced exclusively from reclaimed materials. Maybe that coffee table used to be a school house. Your accent wall was once an old country church. In my 20 years of senior home care, I have seen the results of some amazing home changes that our clients have made in order to enable their loved ones to stay at home. 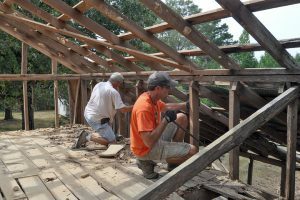 There’s ample reason for the reuse, restore, revitalize craze. Not only is it better for the environment, choosing materials from our past to embrace our future sings directly to the heart. Beth & Jud in their Reclaimed Man Cave aka “Sweet Senior Ensuite Retreat”. I haven’t seen a more thoughtful example of making thoughtful modifications for our loved ones than my friendly neighbors Beth & Jud have made for Beth’s Father to live with them in Columbus, Ohio. Beth’s Father lived his life farming on their families farmland in rural Ohio. 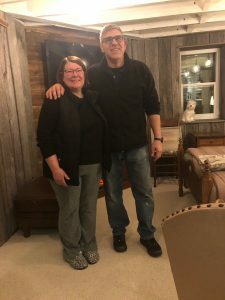 When Beth began to see Dad’s needs increase and spoke to him about his options, she felt a tug that would not only take advantage of her retired husbands tool belt handiwork, but also Beth’s career as a hands on caregiver. Beth is a Registered Nurse. 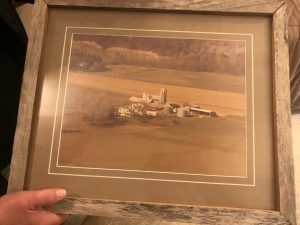 Beth and Jud planned together and came up with an incredibly thoughtful way to bring a piece of the farm into the special place they would create for Beth’s Father. 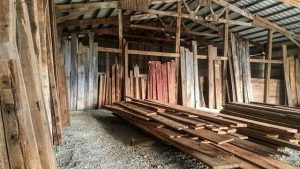 ‘Reclaiming Dad’ would begin by reclaiming some of the precious family barn wood that Jud resized and shaped in order for it to artfully adorn the walls of a truly unique space. This effort catapulted a complete transformation that would begin to take shape and have warmth and familiarity from floor to ceiling. 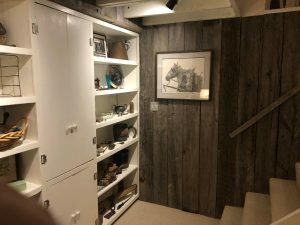 While absolutely ‘on trend’ and while finding an unique way to add value to a lower level space, the measures taken were done with Dad in mind and have embraced the special nature of Dad’s own hard work and will be a lasting reminder of Beth’s Dad’s life’s work. 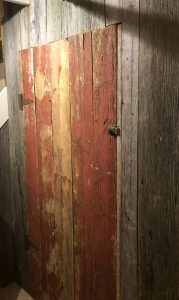 That beautiful outhouse door? Now a storage closet door. In addition to enabling Dad to spend his days in the familiar comfort of the families 100 year old restored/reclaimed barn wood, Dad will slumber in the comfort of the very bed he slept in as a boy. As a feature entrance wall, ample shelving was placed creating special dedicated space for photos and important memorabilia. Dad will be able to daily enjoy these relics of his past and photos of he and his late wife. Dad’s numerous accomplishments and sentimental belongings will be the first thing he will see when entering his new special home. Reclaiming Dad’s barn wood into their home will enable the same comfort of Dad’s old home to be a part of his new home. Reclaiming Dad into Beth & Jud’s home will place him in a comfort of surroundings that will make the journey home complete. With an attentive care plan enabling Beth to utilize her own care insights and to have the ability to pass the baton over to our great team means a collaboration as important as every other measure that’s been taken to lay out an incredibly soft and warm welcome: Reclaiming Dad. Our Care knows no exception. Not only can we provide our care in advanced need, Our motto states: “Your Home. Your Rules.” We will provide our care in the way of your choosing, at your schedule. 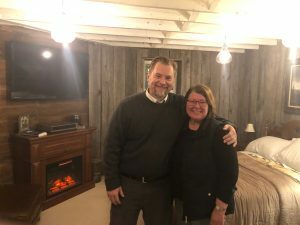 Ben Smith poses with Beth in the renewed Farmhouse Retreat in Beths Home. previous post: Caregivers. Our Everyday Superheroes.